The use of many artefacts can only be inferred from their context and association, and tattoo needles are no different, although, if sufficiently well-preserved, scientific analysis of their tips may identify traces of blood or the pigment used to create the tattoo. 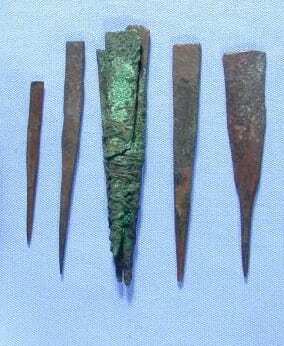 In the absence of any such scientific testing, uncertainty remains as to whether the 7 prick points in the Petrie collection were used for tattooing. However, the decorative markings on a collection of blue faience figurines are less ambiguous. Although ancient Egyptian textual records make no mention of tattooing, there is nevertheless a considerable amount of iconographic evidence for the practice, which includes the engraved markings on faience figurines such as those on display in the Petrie Museum. Interestingly, these “tattooed” figures are invariably female, suggesting that tattooing was practiced exclusively by women. Faience figurines dating from the Middle Kingdom traditionally known as “Brides of the Dead”, frequently display a series of dotted geometric tattoo patterns, running in horizontal bands across the lower abdomen. Occasionally, the thighs are also decorated, as can be seen in the example shown (left). There are many examples of footless faience figurines such as these in museum collections around the world. According to Robert Bianchi, dependent upon their context, these figurines maybe interpreted ‘as guarantors of the deceased’s procreative abilities on analogy with those of the goddess Hathor’, who both represented fertility, childbirth and love, and welcomed the dead into the next life. Faience figurines are often found in tombs, interred with the dead in order to ensure resurrection. 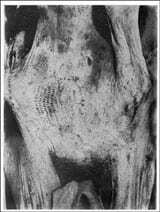 Tattooing practice in ancient Egypt is further supported by the discovery of a number of tattooed mummies in the late 19th and early 20th centuries. The most famous of these was discovered in Deir el-Bahari by French Egyptologist Eugène Grébaut in 1891. Dating from Dynasty XI (c.2134-1991 BC), a female mummy identified as Amunet, a Priestess of the goddess Hathor at Thebes, was found to have a number of tattooed markings on her body, which show striking correspondence with the patterns depicted on Middle Kingdom faience figurines. A design consisting of multiple diamond shapes composed of dots, are tattooed on the middle of her right thigh, similar to those engraved on the faience figure pictured above. 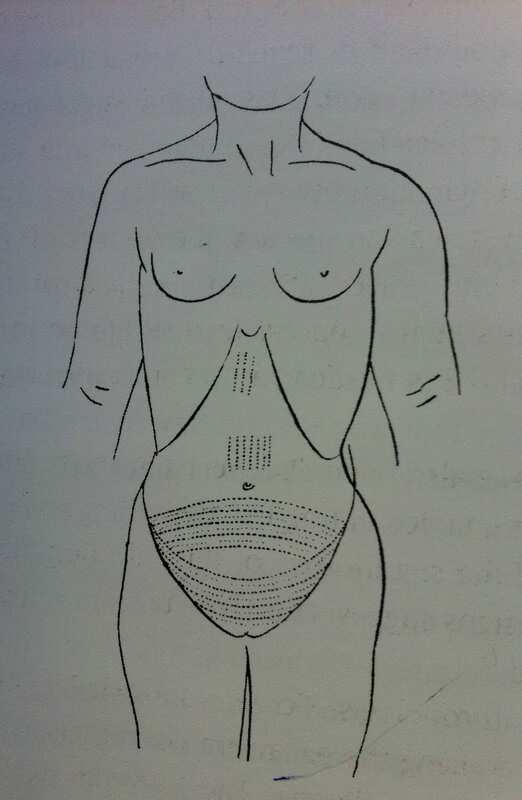 As well as tattoos on her left shoulder and breast, and on her right arm below the elbow, Amunet also bore extensive tattooing over her abdomen: A series of dots and dashes forming an elliptical pattern of rows covers almost the entire abdominal wall in the suprapubic region (see sketch below right). to the mummified remains of Amunet. Tattoos on the abdominal part of the female body would have become particularly notable when the woman became pregnant – the patterns would expand, forming an even more symbolically interesting pattern, like a web or netting design. The mummy of Amunet was unearthed at the height of the “Golden Age” of Egyptology, when the discovery of mass burials of mummified royalty and clergy became a source of popular fascination. As “Egyptomania” swept across Europe, some artists sought to commemorate the “great discoveries” of European explorers and scientists. 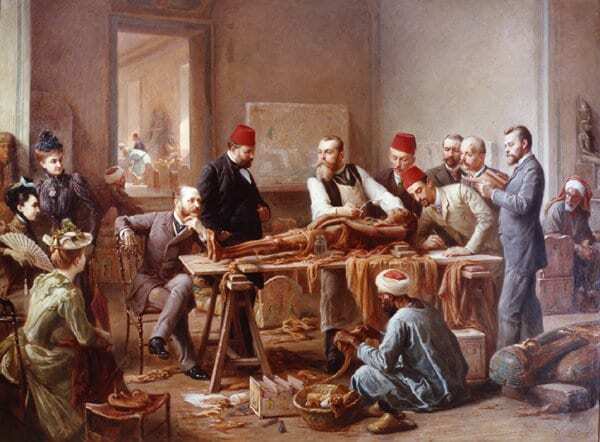 For instance, the painting below, by French artist Paul Dominique Philippoteaux, depicts an historical event: The unwrapping of a mummy discovered at Deir el-Bahari, the same site where Amunet was buried. Although the mummy pictured dates from Dynasty XXI (c.970 BC) in the Third Intermediate Period, many of the men present in this scene were also involved in the excavation of Amunet. The eminent Dr. Daniel Fouquet takes centre stage, demonstrating to his learned audience of colleagues and lady spectators, as he unveils the mummified body of the “Priestess”, known as Ta-usa-ra. Mr. Grébaut, the leader of the expedition, also appears in the painting, second from left and wearing a fez. Oil on canvas, by Paul Dominique Philippoteaux. 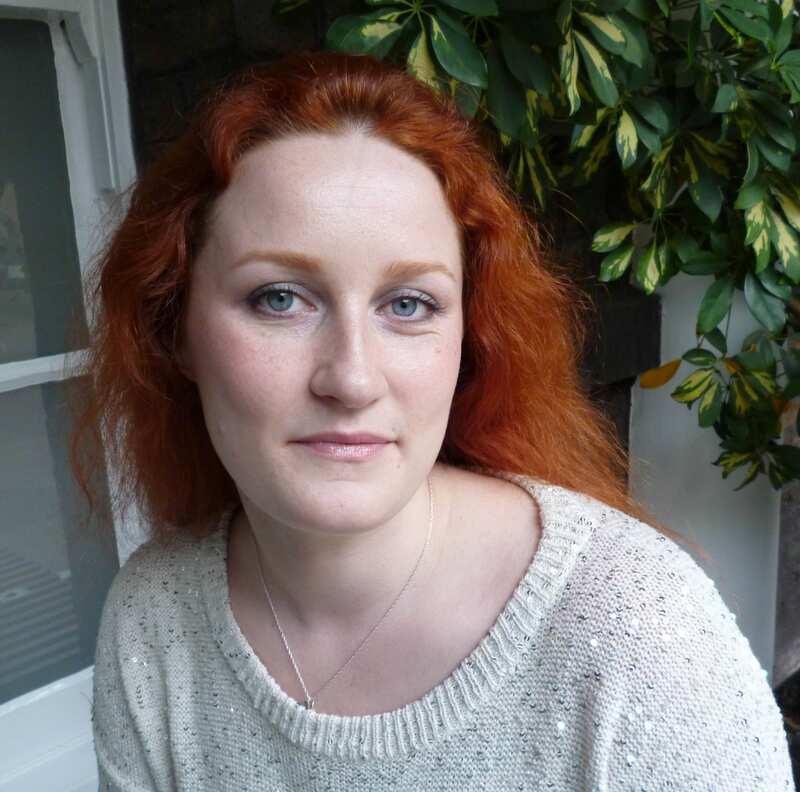 Photo credit: Peter Nahum at The Leicester Gallery, London. The examination of these scars, some white, others blue, leaves in no doubt that they are not, in essence, ornament, but an established treatment for a condition of the pelvis, very probably chronic pelvic peritonitis. The priestess Amunet and the figurines…have an undeniably carnal overtone. The eroticism that is undoubtedly associated with Egyptian tattoo of the Middle Kingdom correlates with the prevailing religious attitude that linked physical procreation with the loftier aspirations of resurrection in the Hereafter. Amunet’s mummified remains now lie in the Egyptian Museum of Antiquities, Cairo. Did tattooing really have a medicinal purpose in the Ancient world? Check back for my next post on the history of tattooing as a therapeutic practice – and the health risks involved in becoming tattooed prior to modern antisepsis. Geoffrey Tassie, ‘Identifying the Practice of Tattooing in Ancient Egypt and Nubia’, in Papers from the Institute of Archaeology, Vol.14 (2003), p86. According to Tassie, there is only one exception in the archaeological record – a Dynasty XII stele (a standing stone tablet) from Abydos: ‘This depicts a figure, which is said to be male, with marks coming down over the chest. As the stele is extremely worn it is hard to distinguish whether the marks indeed represent tattoos.’ (Ibid, p.88). Robert Bianchi, ‘Tattooing and Skin Painting in the Ancient Nile Valley’, in Celenko, T. (ed.) Egypt in Africa, (1996), Indianapolis University Press, p.81. Philippoteaux’s painting includes a plaque inscribed (in French) with the names of the sitters, as well as an historical description of the scene. From left to right: Marquis de Reverseaux (Ministre de France au Caire); Mr. Eugène Grébaut (Directeur Génerale du Service des Antiquities); Dr. Daniel Fouquet (Médecin au Caire); E. Brugshe Pacha (Conservateur du Musée); Mr. Georges Daressy (Conservateur adjoint du Musée) – pictured taking notes; Mr. H. Bazil (Secrétaire complable du Musée); Mr. J. Barois (Secrétaire Génerale du Ministére du Travaux Publies); Mr. U. Bouriant (Directeur de la Misien Archéologique française au Caire). Daniel Fouquet, ‘Le Tatouage Medicale en Egypte dans l’Antiquite et a l’Epoque Actuelle’, in Archives d’Anthropologie Criminelle, Tome 13 (1898), p.271. Available online at Criminocorpus. Translated from the French: L’examen de ces cicatrices, les unes blanches, les autres bleues, ne laisse aucun doute dans l’espirit, il s’agit la non d’un ornement, mais bien d’un traitement institué pour une affection du petit bassin, très probablement une pelvi-péritonite chronique. See also: Carolyn Graves-Brown, Dancing for Hathor. Women in Ancient Egypt, (2010), London New York: Continuum Books.